As a specialist security print, digital print and direct mail printer, our products can be supplied in continuous format, laser cut, as loose slips or made up into books depending on requirements. Our print partners and direct customers trust us to deliver rapid, reliable and competitively priced print on time, to budget, and with no hidden charges. We have a responsive, creative, design studio comprising talented graphic artists who work to plan and design exactly what you need. Corinium Colour is the brand that houses digital and litho print, offering a full design and artwork service. Find out more about Corinium Colour. 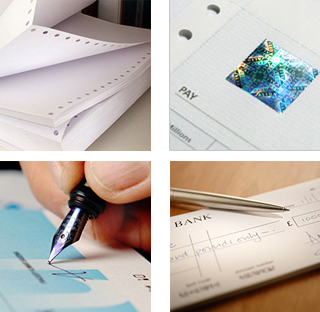 Our reputation as a security and cheque printer is one of unrivalled experience, innovation and reliability, and we are able to produce security print within 24 hours of proof approval. This solid reputation has been built over the last 25 years – handling cheque design and cheque printing requirements for leading banks, institutions and organisations throughout the world. Our cheque printing facility is C&CCC accredited and we hold ISO 27001 for Information Security Management. Corinium Continuous supplies volume continuous part stationery and business forms, applying the same high standards as we do our secure print. Find out more about our printed products. Our 10 colour UV press comfortably handles high volumes with consistent quality and accuracy. View our Plant List. Alongside our volume printing services, is our digital and bespoke print services. We offer professional printing for short-run jobs using digital or litho printing methods depending on product, quantity and budget. We can print on watermarked paper, customise your logo or create a truly personal touch.